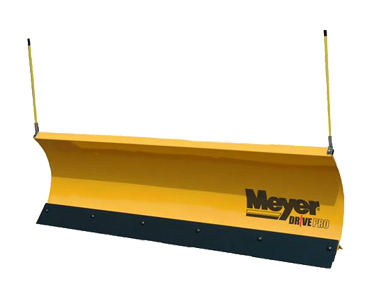 Attach this Meyer 80 inch Drive Pro Plow to your compact tractor or skid steer for all-season use. Mounting is easy with the universal attachment plate mount for skid steers and compact tractors. A 65° aggressive attack angle clear more snow in less time for an optimal performance. And, full trip reduces wear and tear on the vehicle and plow by allowing the whole moldboard to trip when being struck by an obstacle. Vehicle Applications: Designed for compact tractors and skid steers. 65° Attack Angle: More clearing performance in less time with this aggressive attack angle for superior back-dragging performance. Plow Material: Plowing is a breeze with this 80 inch plow that’s designed out of durable steel, polyethylene and coated with Dura slick™ paint for better snow plowing action. Ask us about the Meyer 51110 80" Drive Pro Tractor/Skid Steer Plow. Please no repair questions. Your Q&A may be posted to SnowblowersAtJacks.com to help other shoppers, like you, with their purchasing decisions. Thank you.